A great day of racing completed Friday outside the Rio All-Suite Hotel & Casino in Las Vegas with the first two rounds of heat racing on the docket for the Superkarts! USA SuperNationals XVIII presented by MG Tires. Perfect weather conditions with a little bit of a chill later in the day once the sun went down and the lights turned up, but the action on track was hot with the nine categories finishing their first two rounds of racing. Keeping mistakes to a minimum was the objective of the day, with a few drivers standing out as solid contenders as the race weekend continues. A major pile up in turn two began the opening heat race of the day and for the TaG Junior category. Involved was outside pole Braden Eves (CompKart). 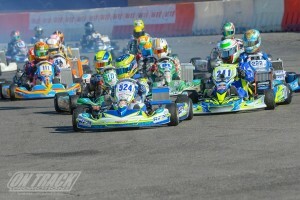 This allowed Matias Fernandez (AM Kart) to take over the lead from pole sitter Julien Andiauer (Praga). The Argentinan driver walked away for the win in the eight lap event. The fight was for second as Colton Herta (FA Kart) put the pressure on the top qualifier. JP Southern (PCR) join the fight as the quickest driver on the course. Herta assumed the second spot for some time, but Andiauer returned to the spot by the checkered flag. Southern was a solid fourth, as Ulysse De Pauw (Birel) held off Neil Verhagen (Arrow) for fifth. The second opening heat race for TaG Junior had two false starts, forcing race director Terry Bybee to have a short meeting with them. 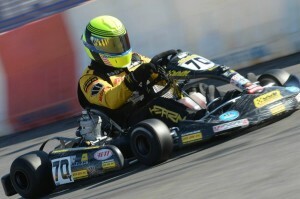 Logan Sargeant (Tony Kart) was moved back, putting TaG Junior rookie Gianluca Petecof (Tony Kart) on the pole position. The Brazilian led early, but Sargeant quickly retook the spot and began driving away. The fight on track was for second with a host of drivers with Petecof holding off Tazio Torregiani (Haase). 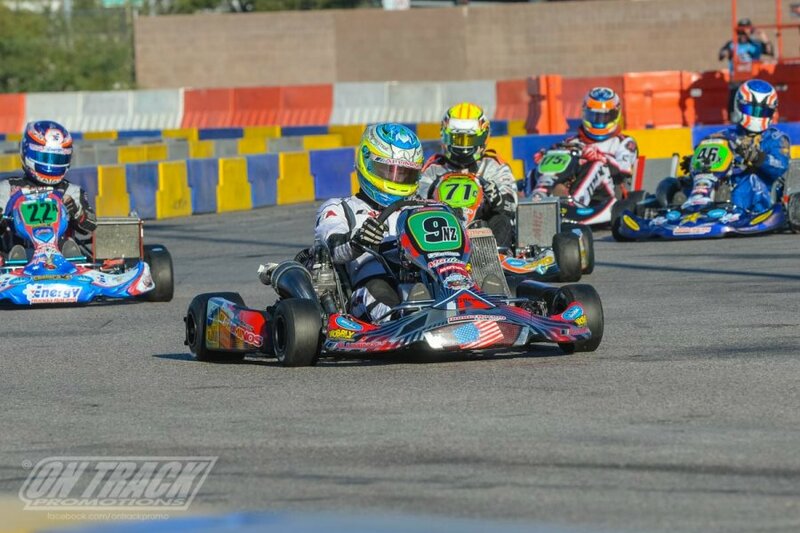 Pro Tour point leader David Malukas (Top Kart) was right there, placing fourth with his Top Kart USA teammate Zach Holden in fifth. Lots of contact in turn one and turn two once again as the TaG Junior category opened up the second round of heat races. 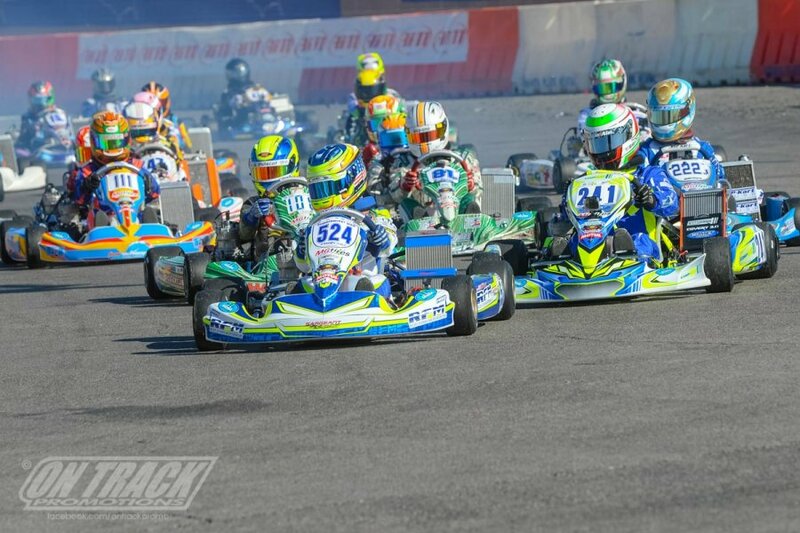 At the front, Luiz Branquinho (Italkart) assumed the lead, coming from 11th as all the leaders up front got together but continued on. De Pauw moved to second, right with the leader as Verhagen ran third. Andlauer and Matt Solarczyk (Birel) made up the top-five and Malukas close in sixth. It was a two, by two, by two, by two for the top eight on the track as they reached lap five. That’s when they began shuffling behind the top two. Verhagen was getting shuffled back with Andlauer starting the movement, then contact with the barrier outside turn six pushed the KartSport North America driver back to eighth. That promoted Malukas to fourth, trailing the top qualifier. With clear track, Andlauer closed up on the dicing leaders with three laps remaining. Lap nine, the Frenchman was into the second spot, and began closing in on the leader Branquinho. It wasn’t enough as the Italian Motors USA driver scored the win. Malukas moved to third as De Pauw was dropped to seventh behind Fernandez and Christian Brooks (Tony Kart). A much cleaner start for the category compared to the previous three attempts, with Sargeant controlling the lead. Eves secured the second spot with Herta up to third, leading a long line of drivers. Sargeant pulled away lap after lap, with the fight for second stepping up on lap five. Justice Lepe (Tony Kart) came away from the lap long skirmish, dropping Eves back to fifth behind Herta and Holden. Eves continued to get shuffled back and then retired on lap eight with contact to the entering turn one. The wild race continued to the checkered flag after nine circuits, with Sargeant scoring the dominant win. Lepe drove to second with Holden up to third, dropping Herta to fourth while Anthony Gangi Jr. (Tony Kart) drove to fifth from 12th on the grid. The first holeshot of the 2014 SuperNationals went to top S2 qualifier Kyle Kirkwood as the Ocala Gran Prix driver jumped out to the lead. Senior rookie Jarred Campbell (Intrepid) slotted into second with Pro Tour point leader Kolton Griffin (Tony Kart) right there in third. A fight early for second allowed Kirkwood to pull away some, but they kept the SpringNationals winner in sight while former S4 SuperNationals winner Chris Jennings brought his DRT Racing / DR Kart into the mix, dropping Aussie Jason Faint (Energy) to fifth. With Griffin in second, they closed back up on the bumper of Kirkwood by the halfway point. Kirkwood held on, leading all 12 laps with Griffin and Campbell right there. Jennings fell back but maintained fourth ahead of Faint. GP driver Loris Ronzano earned the holeshot to begin the second opening heat race for S2, and jumped out to a solid lead early. Mexican driver Fenando Casillas Jr. (DR Kart) and Miguel Lopez (GP) slotted in behind, as the top three held a comfortable advantage. Pro Tour point leader Austin Garrison however started to find his grove by the halfway point, posting fast laps of the race to reel in the top three. Lopez and Casillas went back and forth, allowing Garrison to close in right there on lap seven. A mistake by Ronzano allowed Casillas and the rest of the group to close in on lap nine. Ronzano fell to second, then third, and then fourth by the end of lap 10. As the white flag waved, Garrison went for the lead into turn one. He missed a shift on the exit, allowing Casillas to retake the position and then Lopez around for second. They would finish that way as Will Preston (Aluminos) moved up to fourth and Luke Shanahan (Tony Kart) to fifth. Ronzano moved back to seventh, suffering a mechnical issue. Another large pile-up in the crucial turn two collected a number of drivers on the opening lap, but out front Kirkwood grabbed his second holeshot. His lead was basically an inch as Griffin kept his nose right on his bumper with a handful of others right there looking for a way to move forward. Austin Schimmel (CRG) was the first to pull the trigger, getting past Griffin at the start of lap four. Garrison was the next, coming from eighth and into the fourth spot as they completed the lap, dropping Casillas to fifth. Schimmel and Griffing continued to run nose to tail, with the pressure heating up as the laps clicked off. A space opened for Garrison, and he took it on lap 10, moving into third and dropping Griffin back to fourth. This allowed Kirkwood to drive away to the victory with Schimmel second, Garrison third and Casillas moving to fourth ahead of Griffin, costing him some valuable points in the championship chase. The final S2 holeshot of the day went to Campbell, getting off the line better than pole sitter Ronzano, taking the lead on the opening circuit. Ronzano continued to fall back, sitting fifth after the second circuit with Lopez, Finley and Faint around and then retired early. Out front, Campbell was felling the pressure from Lopez, who was running the fast laps of the race. The top-five were spread out good, but the driver on the move was Kotyk. The OGP driver moved into fifth after Ronzano dropped out, up to fourth and then on the closing lap advanced to third, working past Finley and Faint. Campbell held off Lopez for the win as the top two kept it clean the entire 10 laps. Texas drivers Trenton Estep (Sodi Kart) and Jacob Loomis (Intrepid) filled the front row, with Loomis earning the holeshot. The two pulled away early with Raul Guzman (GP) giving chase in third. As the race went on, the trio close in tighter, all looking for a chance to lead. Lap eight, Estep took the point for the first time, and all this fighting allowed Matias Ramirez (Tony Kart) to inch up into the mix. By lap nine, the hard charging Christian Brooks (Tony Kart) was into the fifth position after starting 15th, and closing up on the top four. Loomis returned to the point with Guzman and Ramirez pushing Estep back to fourth. At the checkered, Loomis held off Guzman for the win with Estep back to third. Brooks gained another position at the end, pushing Ramirez back to fifth. Loomis once again showed he had the quick reaction of a drag racer, getting off the line to steal the lead as Heat #2 began. Estep dropped to second with a full seven drivers making up the lead group. Guzman was third for the first four laps, but quick driver Ramirez jumped into the position. As they began lap seven, the front four went two by two, with Estep and Ramirez sliding past Loomis for position. Lap eight, shuffling continued and Loomis suffered, making contact with the outside barriers on the exit of turn two. Ramirez now held the lead with two laps remaining. On the final lap, it was a battle for second with Guzman coming away with the position as Ramirez took the win. Callum Smith (Intrepid) drove to fourth with 2012 winner Patricio O’Ward (Praga) in fifth. Top qualifier Kip Foster (Arrow) led the field to the green flag for the opening heat race, and paced the field the opening two laps before IndyCar’s Will Power (Arrow) took over the lead. Richie Hearn (MMK) was right there, making it a three-driver lead group. Foster took back the lead on lap five, and pulled a little gap as they fought for second. 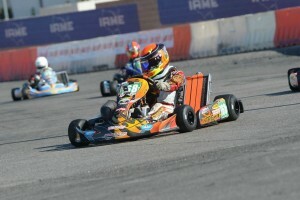 This allowed Pro Tour point leader Billy Cleavelin in the CRG to close up, bringing Diego Pelosi (Tony Kart) with him. as five karts ran nose to tail. Lap seven, Hearn made hard contact with the barriers on the outside of turn one, badly bending his axle to put him on the sidelines. That move three-time winner Leonardo Nienkotter (CompKart) into the top-five, all with a sizable advantage on the rest of the field. They crossed the line with Foster at the point, and everyone in the same position with Nienkotter past Pelosi on the final circuit. Hard shuffling into the opening corners for the TaG Master group shuffling up the field a lot, except the top two as Foster and Hearn pulled away. Hearn, recording the DNF in heat one, attack early looking for that zero point entry for a win. Lap two, he worked past Foster for the lead, and Power followed through. Foster ended up dropping to fourth as Cleavelin moved to third, with the top-five now running all together. Lap five, Cleavelin moved to second, working past Power at turn two, which opened the door for Foster at turn four to take over third. Foster continued his run back to the front, working past Cleavelin for second with sent him dropping back to fifth with Power and Nienkotter through. They would finish that way, with Hearn accomplishing the feat he set out for, a win. It is a CRG front row for all three S1 heat races as Davide Fore and Fritz Leesmann set the pace in qualifying. Fore grabbed the holeshot but Leesmann was not to be denied, taking over the lead from the five-time world champion on lap two. 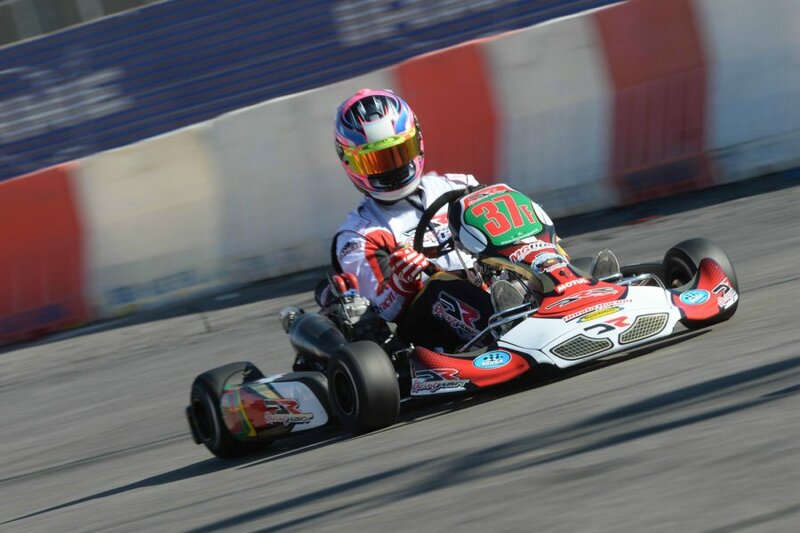 Fore continued to fall down the order as Pro Tour point leader Jordon Lennox (CRG) moved past, with Fore dropping to sixth with Danny Formal (DR Kart), Gary Carlton (TB Kart) and Matt Jaskol (CRG) into the top-five. Leesmann held a sizable lead with the fighting, as Formal and Carlton worked past Lennox on lap four. Nearly three tenths quicker on lap six, Formal was right there on the back bumper of Leesmann, with the rest of the top five following. Formal pulled the trigger on lap nine, taking the lead for the first time. Leesmann came right back before the lap was complete, bringing Lennox into the fight for the top spot. The UK driver moved past Formal at turn one, and held the spot to the checkered flag as Leesmann won the opening battle. Fore worked back to fourth, demoting Carlton to fifth. Drama unfolded before the green flag even waved as Jaskol and Canadian Scott Hargrove were unable to hit the track, each with a mechanical issue on their machines. Once the lights went out, it was a holeshot for Fore with Leesmann dropping into second. Formal was quick on cold tires, demoting the two-time Pro Tour champ Leesmann to third, and a lap late taking the lead from Mr ‘Five-Time’. Fore then went defensive with Leesmann on his bumper, allowing Formal to pull away. Pressure applied to Leesmann by Lennox gave Fore the room to lay down some fast laps of the race to inch toward Formal. As the final lap began, yellow flags around the track bunched the lead quartet. Formal was able to hold off Fore, who in turn kept Lennox back, but Leesmann won the drag race to the line for the third position. Oliver Askew (Tony Kart) came from 21st to fifth, taking advantage of the opening lap wreck that included Nick Neri (Tony Kart), Carlton and 2012 S2 Pro Tour champion Sabre Cook (CRG). Top qualifier Matt Hamilton (Aluminos) and Trevor McAlister (Praga) were bested by veteran Darren Elliott (CRG), grabbing the holeshot from inside row two. Hamilton came on the attack quickly, reassuming the point on lap two. Aussie Jason Faint (Energy) came through, and then Elliott made a mistake on lap four, spinning in turn two and falling back to seventh. That put McAlister back to third with Chris Jennings (DR Kart) and Howie Idelson (CRG) making up the top-five. With just a few laps remaining, ‘T-Mac’ pulled the trigger and took the second spot from Faint. Faint returned the favor on the final lap, getting the pass completed in turn six, bringing Jennings with him. Hamilton took the win with lots of room, while former winner Bonnier Moulton (Tony Kart) drove to fifth from 14th, passing Elliott on the final lap. The spot was Robert Marks (CRG) until contact on the exit of turn five put him into the wall on lap nine. Just like the first race, the inside of row two was the best starting spot, as Italian Roberto Toninelli (Vemme) grabbed the holeshot from polesitter Jimmy McNeil (CRG) and Gian Cavaciuti (GP). As they began lap three, both McNeil and Cavaciuti drafted past for position, and began to drive away. 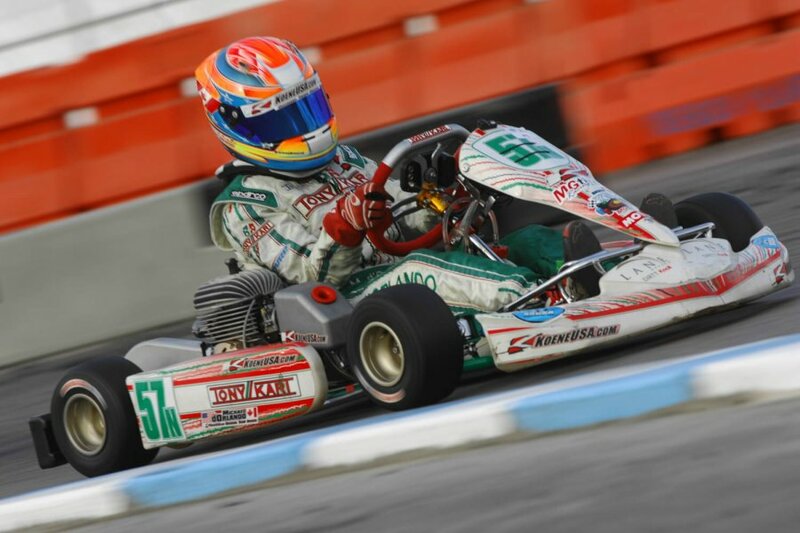 Toninelli came under pressure from Mike Mantel (Tony Kart), Rob Logan (CRG), Mike Beeny (Tony Kart) and defending Pro Tour champion Jordon Musser (Birel). The order did not change, aside from Beeny working his way up to fourth with Mantel back to fifth, all behind McNeil as the winner. Elliott grabbed back to back holeshots as Hamilton was slow off the line once again. The Kiwi fell back to fifth in the opening corners, crossing the line for the first time in fourth behind Cavaciuti and Logan. Lap two, Hamilton was back up to second, and tried Elliott but fell just short with a criss-cross move on the exit of turn one. Lap four, Hamilton took over the point with Logan moving past Cavaciuti at the same time. The lead group was 15 karts deep still after five laps, with Hamilton slowly creeping away. Cavaciuti fought back and was into third and then up to second after moving past Elliott. The top two pulled away as the rest of pack continued fighting for every position. McNeil took advantage of the pole position, getting the holeshot and leading the way with McAlister in second and Toninelli in third. The 12-lap run was not as exciting as the last, with McNeil well out in front and the top four all spaced out enough with Faint in fourth. The fight was for fifth that included Idelson, Mantel and Olpin. The final lap, Mantel took the spot but Idelson fought back, and held it to the checkered behind winner McNeil. After just one lap, a red flag was brought out for fourth place qualifier Lochie Hughes (Praga), who walked away with no serious injuries. Once restarted for the eight-lap event, Sam Mayer (Merlin) took the lead followed by two other east coast drivers – Alex Verhagen (Arrow) and Nicholas d’Orlando (Tony Kart). Verhagen took over the lead on lap three with a good draft into turn one. D’Orlando did the same the following lap, move Mayer back to third, but the Franklin Motorsports driver fought back to keep in second. The trio however was getting run down by fast driver Dylan Tavella (Tony Kart). Lap five, d’Orlando moved back to second, and triggered more action with top qualifier Trey Brown able to get back up to fourth, moving Tavella to fifth. As they continued to shuffle behind them, the top two drivers were nose to tail as d’Orlando caught Verhagen. Side by side, they ran to the checkered flag with Verhagen scoring the win. Tavella won the fight for third with Giovanni Bromante (Deadly), coming from 18th to steal fourth from Brown as Mayer fell to seventh behind Broc Feeney (Tony Kart). Jack Doohan (Tony Kart) assumed the lead from the pole position of the second opening heat race. Michael d’Orlando (Tony Kart) followed him through with Jak Crawford (Benik) in third. The pressure was applied early by d’Orlando, looking for a way into the lead and around Doohan. One attempt in turn seven failed, and he regrouped to try another attempt. As d’Orlando waited, Crawford was inching closer. With two laps remaining, the top three were together. They began mixing it up and that allowed a charging Guiseppe Fusco (Lenzo) into the game. Running the fast laps of the race, Fusco was there and into third as the white flag waved with Crawford now second. Fusco moved to second in turn four, but Crawford fought back. Six drivers fought tooth and nail for the second spot as Doohan scored the win. 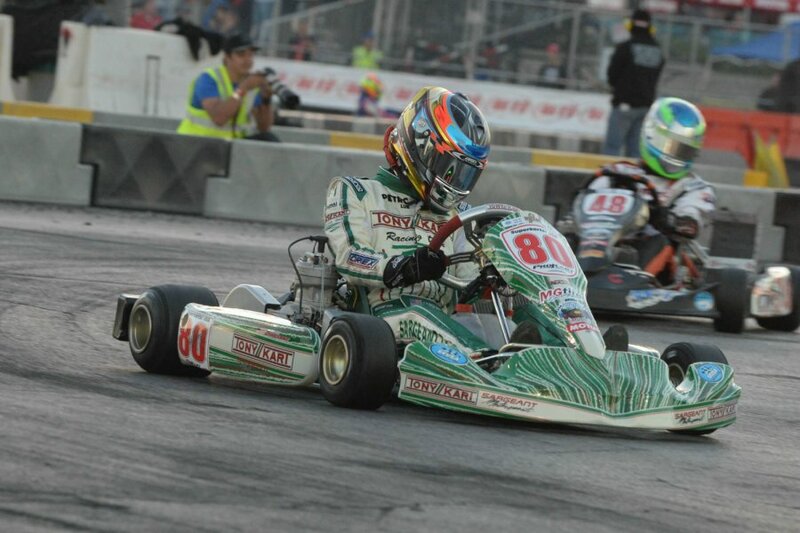 At the line, Kaylen Frederick (Tony Kart) earned the position with Leonardo Marseglia (CRG) to third. D’Orlando was second, but dropped to fourth in the final few corners with Derek Carmenate (Benik) to fifth. Fusco used the outside line to show the way in the opening lap of the heat race. Brown fell back to third with Carmenate up to second from fourth. The top five were nose to tail, with Nicholas d’Orlando and Tavella right there. The one on the move was Tavella, as he slowly moved his way up to second and closing in on the Italian Fusco. Tavella, up from 11th, kept close but did not make an attempt on Fusco, scoring the win in the Lenzo. Carmenate was third with d’Orlando fourth and Brown fifth. Doohan and Michael d’Orlando hooked up from the inside line to pull away early on in the 12-lap heat race. Crawford found himself alone in third with Pro Tour point leader Jagger Jones (Tony Kart) fourth and Frederick in fifth. D’Orlando took his turn at the point before the halfway mark, as the two still enjoyed a solid lead over Crawford. The move ended up becoming the pass for the win, with d’Orlando to the checkered flag first. Jones posted the fast laps of the race while running fourth behind Crawford, with Verhagen winning the battle for fifth. 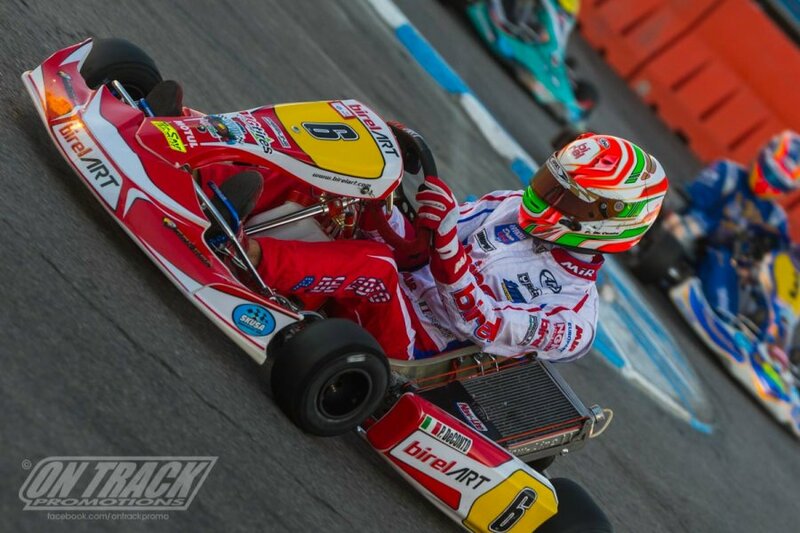 The opening heat race was all Paolo de Conto, as the BirelART driver grabbed the holeshot and led all 12 laps of the race. It was a fight all race long as the top-10 ran nose to tail in an amazing race that the fans in the grandstands could enjoy. The fight for second included former winners Bas Lammers (Formula K) and Jonathan Thonon (Praga). Some hard fought racing went on lap after lap with de Conto scoring the win by a half second over Thonon. Lammers finished third with Patrik Hajek in fourth and Jeremy Iglesias (Lenzo) fifth. 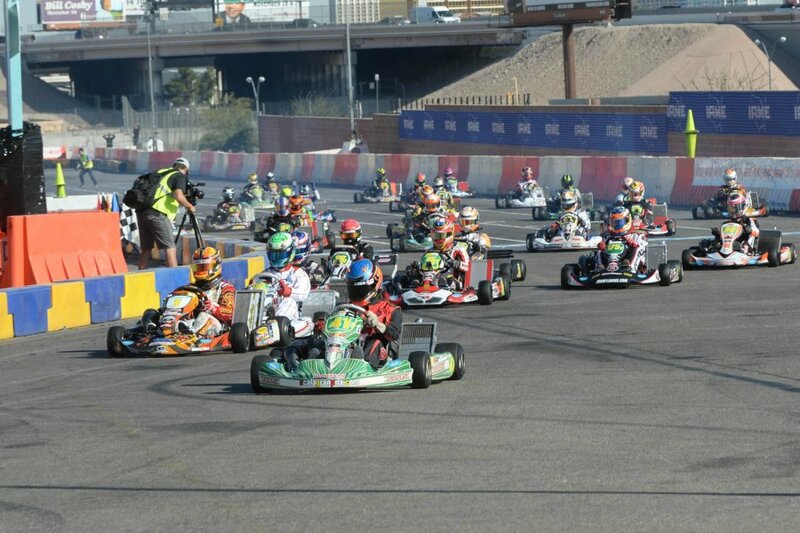 The top American was Gary Carlton (TB Kart) in sixth, just ahead of former world champion Davide Fore (CRG). 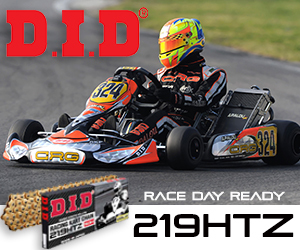 De Conto showed again that he is here to win the $10,000 in his final race for BirelART, winning the second heat race. Kiwi Daniel Bray (Aluminos) and Lorenzo Camplese (Maranello) were among those involved in turn two wreck on the opening lap. The race did not belong to de Conto the entire time, as Lammers took his first laps at the point after moving to the lead on lap four. De Conto returned to the point a few laps later, and was able to drive to the win after they fought for the second spot behind him. Thonon would move past Lammers for the second spot, with Hajek and Fore right there waiting in the wings. The first corner of the opening heat race for TaG Senior was clean, but the second corner bunched up the field. Thankfully, everyone kept going. Out front, top qualifier Jake Craig (Tony Kart) assumed the lead with Mark Boos (Tony Kart) second and Liam McLellan (OK1) in third. McLellan went to work quick, passing Boos on lap two with Dalton Sargeant (Tony Kart) working past the following lap in the same corner. Sargeant then moved up to second and began closing up on Craig with the fast laps of the race. The lead, which was over a second, dropped to under a half-second on lap seven, and was no more as they completed lap eight. As they received the two laps to go, Sargeant pulled the trigger and took over the lead for the first time, drafting by into turn one. Sargeant established a good two-to-three kart length lead, scoring the win over Pro Tour point leader Craig. McLellan drove to third with Boos fourth and Bobby Kelly (FA Kart), climbing from 18th and taking advantage of the opening lap shuffle to finish fifth. A wild flip by on of the drivers sent him sliding nearly 200 feet and thankfully walk away thanks to all the safety equipment. Out front, Aussie David Sera (Deadly) led the way with fellow countryman Ben Stewart (Arrow) in second. Shuffling on lap three however put Danny Formal (DR Kart) to second as Stewart dropped back to sixth with Vinicius Papareli (Italkart), Austin McCusker (Deadly) and Joao Vieria (Tony Kart) through. Formal laid some fast laps of the race to close in on Sera, with the two out to a five kart advantage over McCusker. On lap five, McCusker was a full three tenths quicker, making it three at the front. As lap seven began, Formal assumed the lead for the first time with a move into turn one. The next time by McCusker did the same to Sera. Stewart took advantage of their shuffling, moving up to fourth and closed in on the trio make it a quartet for the lead. Lap nine, McCusker became the third different leader, moving by Formal. Formal was quick on the opening lap, stealing the lead from Craig. The battle began early with Stewart striking as well, moving past both for the lead on lap two. Italkart driver Vinicius Papareli was right there in fourth as they settled down for a few laps. The fast driver was Italian Marco Maestranzi (Top Kart), running fifth and closing in on the top four aboard a new chassis after wrecking in the opening heat race. Formal seemed to lack the straight speed, as both Papareli and Maestranzi drafted past. Just after, Papareli went into the outside wall on the exit of turn six after contact with Maestranzi. That put Formal back to third with Stewart and Craig along out front. A very fast start began the final heat of Friday action, with Sera holding the top position ahead of Sargeant and McCusker. Lap four, Sargeant powered right by Sera down the straight to take over the lead, with Walton and 2010 winner Andre Nicastro (Techspeed) closing up on the leaders. Lap five, Walton was able to go from fourth to second with a great move at turn two, as Sera fell back to fourth, then fifth with Nicastro powering past as well. Nicastro kept moving forward, getting to third and then second on lap eight. While they fought, Sargeant laid down fast laps of the race to pull out to a solid lead, eventually winning by over two seconds. McCusker made a valiant attempt to take down the former SuperNats victor from the second spot, but came up short. Walton finished fourth with Sera fifth, looking to do some homework overnight.